Victoria, BC – Sydney Pickrem did what she wanted by breaking her own Canadian record in the 200-metre individual medley while Alex Loginov did the unexpected by winning the 50-m freestyle in Sunday’s final night of racing at the 2017 Team Canada Trials. Pickrem won the 200 IM in two minutes, 9:56 seconds. That shaved .48 of a second off the record she set at the 2015 FINA World Championships in Kazan, Russia. It also was well under the time of 2:13.41 she needed to qualify for this summer’s world championships. The 19-year-old had already earned a spot on the world championship team in the 400-m IM. 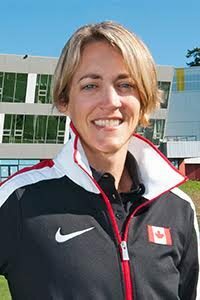 Erika Seltenreich-Hodgson, an Ottawa native who trains at the High Performance Centre – Vancouver, was second in 2:10.97, also under the qualifying time. Sarah Darcel of Victoria, who swims for Island Swimming, was third in 2:12.51. Yuri Kisil of Calgary, who trains at the High Performance Centre – Vancouver and was already qualified in the 100 free, was second in 22.55 while Spencer Bougie of the Pointe-Claire Swim Club was third in 22.75. The trials attracted over 400 swimmers to Saanich Commonwealth Place. The FINA World Championships will be held July 14-30 in Budapest, Hungary. Mackenzie Padington had another big night to kick off Sunday’s finals. The 18-year-old from Campbell River, B.C., who swims for Island Swimming Club, knocked 20 seconds off her personal best time to win the grueling 800-m in 8:31.68 seconds. Olivia Anderson of Toronto, who swims for the Etobicoke Swim Club, was second in 8:37.12. Both swimmers were under the qualifying time of 8:35.56. Danica Ludlow of Victoria, who swims for the University of Calgary, was third in 8:47.12. Padington was coming off the high of gaining a spot on the world championship team by winning the 400-m freestyle Saturday night. “I guess I was still kind of running off that wave,” she said. Toronto’s Mack Darragh, who swims for the Oakville Aquatic Club, won the men’s 200-m fly in 1:57.94, which left him .66 over the qualifying time. Nicolaas Dekker, of the Richmond Rapids Swim Club, was second in 1:59.80 and Montana Champagne, of the Greater Ottawa Kingfish Swim Club, was third in 2:00.45. Eric Hedlin of Victoria, who swims for the University of Victoria Pacific Coast, won the men’s 1,500-m in 15:08.35. Canada will send 32 swimmers (20 women, 12 men) to the world championships. John Atkinson, Swimming Canada’s High Performance Director, said the team shows the progression in Canadian swimming. “The female side of the program continues to move forward after some world-class performances,” he said. “There were also some new athletes stepping forward and making the team. Martyn Wilby, senior coach Olympic program, said the work is just beginning. “I think the key for this is to take the performances from here and build on them moving forward so that we can be competitive in Budapest,” he said. Both swim of the meet awards recognized 100-m backstroke performances. The male swim of the meet went to Javier Acevedo of Toronto, whose time of 53.64 ranks him No. 3 in the world so far this year. The female swim of the meet belonged to Kylie Masse of Windsor, Ont. She twice lowered her Canadian record in the 100 back, with a 58.21 in the final setting a world best on the way to a sweep of all three backstroke events.